Well, I said in my last review that I hoped we would get some plot progress in this episode, and we did! We got a little bit of progress. That’s better than nothing, right? Spoilers for all of it after the jump. In this episode, Pandora summons my worst fear: a nest of wasps. Even worse, when these wasps sting someone, the person becomes really paranoid and irrational and then dies. Abbie and Ichabod figure out that the wasps are going for people in positions of power, and they manage to isolate the wasps’ nest (while keeping an infected Reynolds off their case). Once in the wasps’ nest, they run straight into Pandora, who’s finally done with her death tree. Before either Witness can stop her, the tree opens, and she walks straight into it. I waited on tenterhooks through the commercials, but she didn’t reappear. Meanwhile, Jenny and Joe promise Abbie that they’ll lay off Nevins, for the sake of Abbie’s job. Then they turn around and meet with Nevins anyway. Joe asks Nevins about his dad, but basically didn’t find out anything, and still had to give up the Shard. Nevins made a point of putting on a glove before he opens the Shard up and takes a glowing red stone out of the center. Before I could shout angrily at my TV about Joe messing things up, though, Jenny gets the jump on Nevins’ men and takes the stone (and Joe) from Nevins. Unfortunately, she touches it with her bare hands, and the stone just—disappears. Later, Jenny wakes up in the middle of the night, disturbed by strange dreams—and her skin, like the stone, is glowing red. Although we still didn’t really find out anything, I’m excited about the new plot events. Maybe Pandora will come out of the tree and actually be some kind of monster out of legend, or maybe she’ll have some sort of control over the underworld as Ichabod hints, and maybe it has something to do with whatever is happening to Jenny? And what’s the deal with Reynolds? Abbie and Reynolds mutually agreed to no longer have a romantic relationship, but Reynolds definitely has some unexplored angst about it. I just wish the plot would move a little bit faster. We keep getting tiny hints of future action, but it’s too slow-moving for my tastes. Sleepy Hollow has obviously been doing a good job on the representation front, or at least representation of Black characters—I keep hoping we’ll see people of, well, different color, but Morales and Andy Brooks don’t seem to be returning. However, I’m a little concerned about Sleepy Hollow’s rather cavalier borrowing from other cultures. There was the “Chinese” spider-thing in Season 2, misuse of Native culture in Seasons 1 and 2, and some supposed “Hindu” mythology, again in Season 2. (Season 2 wasn’t a good time for anyone.) Now we have a Caribbean wasp monster. It seems like whenever Sleepy Hollow wants to spice up their random monsters, they bring in someone from some “exotic”, far off place, have them spout some nonsense, and then never bring them up again. Sleepy Hollow is pretty well-rooted in upstate New York, for revolutionary reasons, and it’s fine if the characters never leave—the setting grounds the show, which is pretty necessary in a show as wild as Sleepy Hollow. But other cultures don’t exist just so this show can use a bastardized version of their culture for some excitement. (That’s not even how you kill a Soucouyant, according to folklore.) So I hope Sleepy Hollow thinks over its writing—there are other ways of making creative monsters. Remember her? Alas, poor Caroline! I knew her… for like, two episodes. As for our side characters, I actually really do enjoy some of the interactions we’ve gotten so far—though I’m a huge fan of Ichabbie, I found Ichabod and Zoe’s failures at dating to be pretty charming, and I really like seeing Abbie and Reynolds attempting to out-Slytherin each other. What I’m hoping is that eventually we might get to see a little more of these characters’ personalities. So far, we’ve only really seen these characters as they relate to our main characters—Ichabod likes Betsy because she’s Competent, he likes Zoe because she’s basically Caroline 2.0 (in that she’s cute and into the revolutionary era) and Abbie likes Reynolds because he shares her ambitions and no-nonsense attitude. But because we never get to see anything else with them, all their appearances seem pretty cookie cutter. 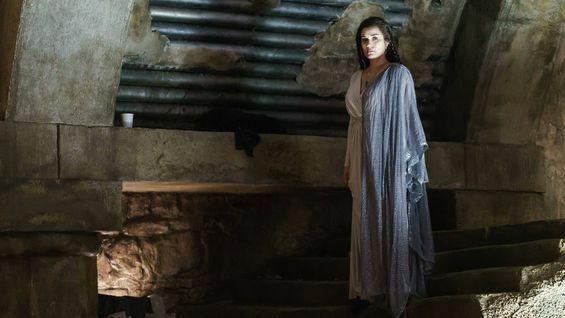 Included in every Sleepy Hollow episode: one scene of Betsy Ross being Strong, one scene of Zoe being Cute, and one scene of Reynolds being Strategic. C’mon, show. As usual, though, despite my complaints, I’m looking forward to the next episode. Team Witness has, this season at least, been pretty good with the communication—Abbie and Jenny are really talking, Jenny and Joe are working well together, and Ichabod’s always ready with a quip about the Revolution and some handy ancient knowledge. So hopefully, Jenny will tell everyone about her weird dreams, and we won’t get any drawn-out drama of yet another person (*cough* Katrina) keeping a secret from her friends. Till next week! This entry was posted in Fantasy, Reviews, Sleepy Hollow and tagged atticus nevins, caribbean wasps, cultural appropriation, daniel reynolds, Jenny Mills, Joe Corbin, Pandora, this red lady from caribee by porluciernagas. Bookmark the permalink. I’m wondering if–going on the Sumerian angle they seem to be hinting towards–they are going to reveal that “Pandora” is actually a mistreated young woman from millennia past in the Near East, and she is looking to incarnate Ereshkigal, perhaps…while there are traditionally seven gates to Irkalla, the six creatures (plus Pandora herself?) might hint in that direction…and the other Sumerian artifacts that Nevins and co. seem to be bringing into the area might point in that direction as well.